Our first stop this past week was Gelateria dei Neri. Both Brett and I chose the Sacher torte flavor which was filled with actual pieces of cake and apricot jam, and he added a scoop of cherry cheesecake while I tried the rice pudding flavor (which was amazing!). I have good news and bad news this week about our daily gelato tastings. Back for a second time at Perche no? I ordered the offbeat but wonderfully delicious curry with mango and pear gelato along with a scoop of honey sesame crunch. Brett chose coffee and chestnut flavors. Bad news first: Winter has arrived in Florence and it has gotten quite cold, especially for us former tropical island dwellers. Because of the cold our desire for gelato has dropped way, way down on the scale of enjoyable pastimes. We’ve had a couple of days where almost didn’t stop for our daily treat, but in the end we got out there and did – yeah us (and, of course it was wonderful)! 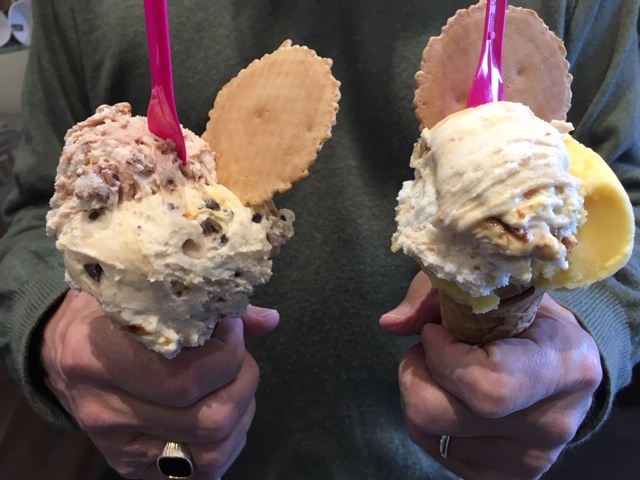 We had spotted the La Strega Nocciola gelateria on an earlier walk but had already had gelato that day so we went back this week to give it a try. 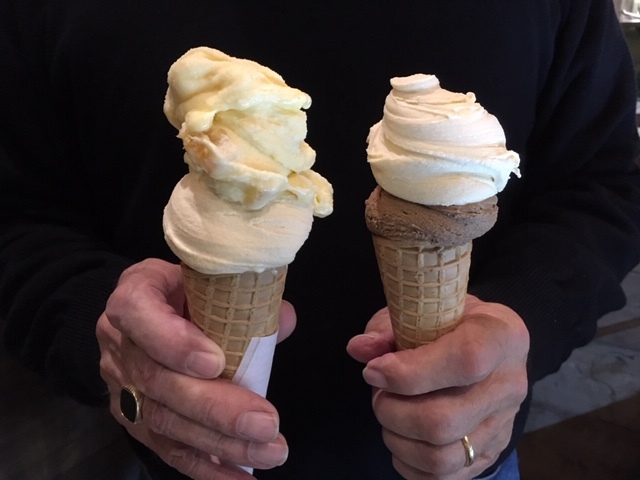 I chose Azteca (white chocolate & cinnamon) and lavender flavors, and Brett had buontalenti (vanilla custard made with mascarpone cheese) and orange cream gelatos. Although our cones were kind of sloppy, the gelato was very, very good. 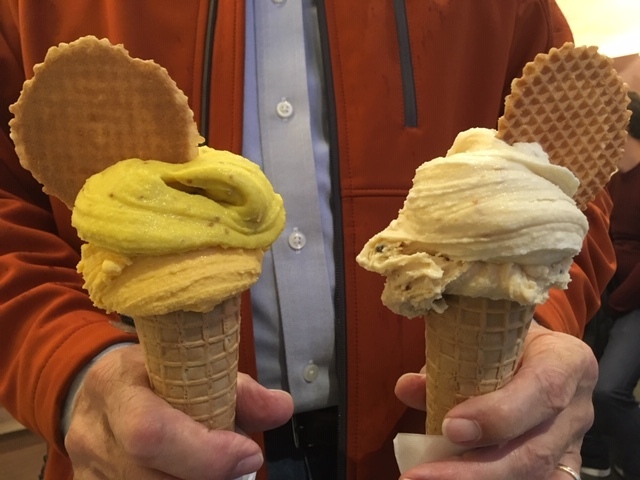 The good news is that in spite of the cold we were able to experience some very exciting flavors of gelato this week, up to and including curry! Who would have guessed that one? 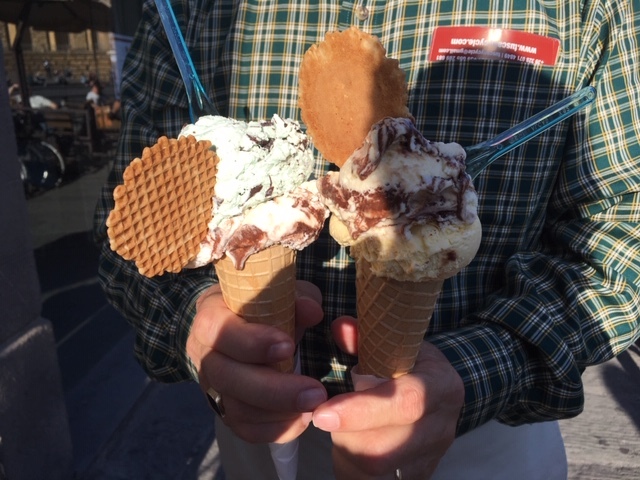 It has been a genuine taster’s market this week, so we feel like we’re leaving Florence on a high note when it comes to gelato. At our first stop at Sbrinno for the week I chose quince and red grape flavors, and Brett decided on mulberry and walnut. We made a second stop at Sbrinno the next day for some of their chocolate flavors: Brett enjoyed chocolate hazelnut with raspberry and chestnut cake while I tried white chocolate and Sbrinno’s Sacher torte (which I preferred to dei Neri’s). 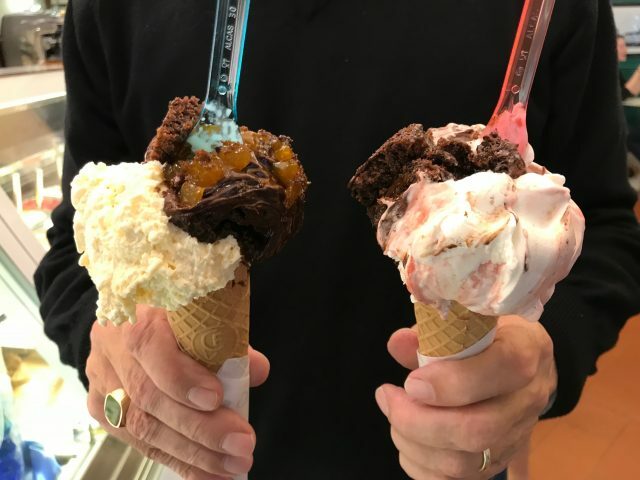 After four weeks, both Brett and I unanimously agree that our neighborhood gelateria, Sbrinno Gelatifacio Contadino, is our hands down favorite in Florence. 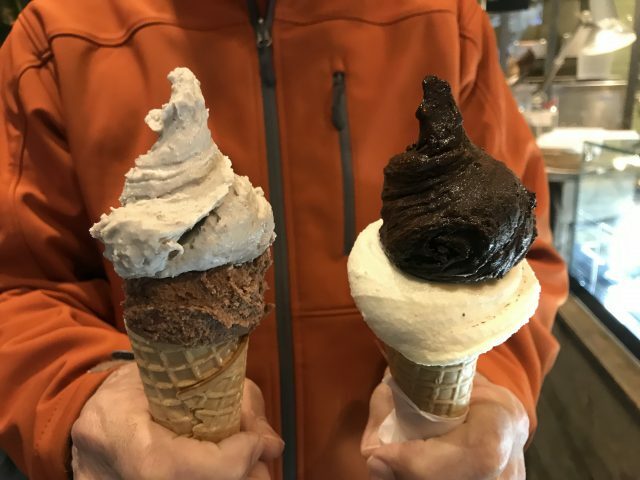 Other places have been very good but Sbrinno has always had interesting and on-point flavors, their gelato is made by hand in the shop (we’ve gotten to watch them make it) and they use natural ingredients sourced from local farms. It hasn’t hurt either that they’re also conveniently located near to our apartment and are open every day, making it easy to stop by the shop on our way home. 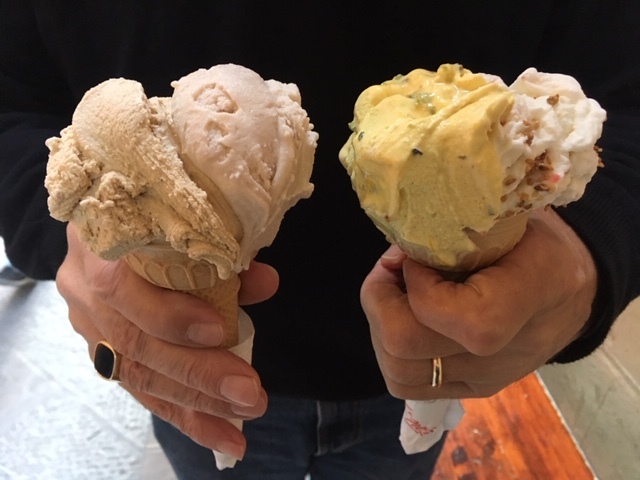 We were not particularly hungry following our pizza class on Sunday evening, but we noticed Cantina di Gelato was open on our walk home so we stopped in for a small cone: I had a scoop of peanut butter, and Brett again chose creamy buontalenti. 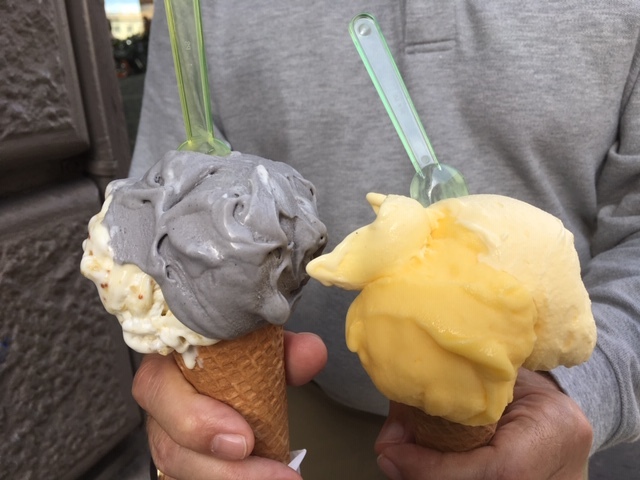 While we are not exactly tired of gelato and have had a lot of fun searching out different gelateria, both Brett and I feel like we need a break, so are not sure how much gelato we will eat while we’re in Rome. We’ve been warned though that the gelato there is quite delicious, so we may not be able to resist! Brett may not be ready to give up his hand model gig either. 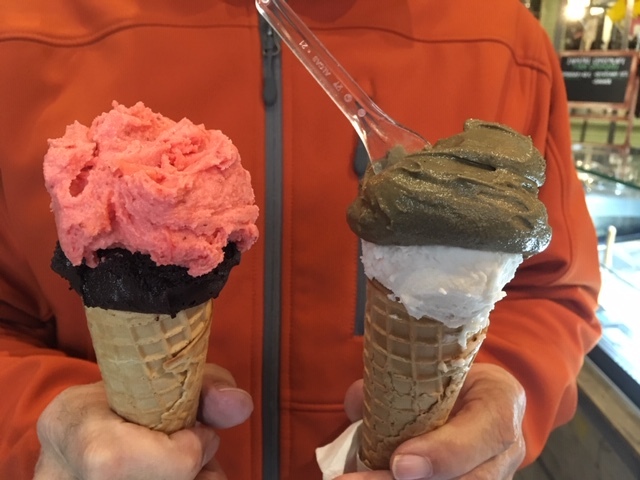 We went back today to La Carraia today but none of their flavors appealed to us, so we walked back once more to Sbrinno where I discovered they had licorice gelato (and licorice is one of my favorite things)! After some discussion with the server and a few tastings I paired it fresh pear, which contrasted nicely with the strong licorice flavor. Brett chose dark Sicilian chocolate and added a scoop of strawberry. 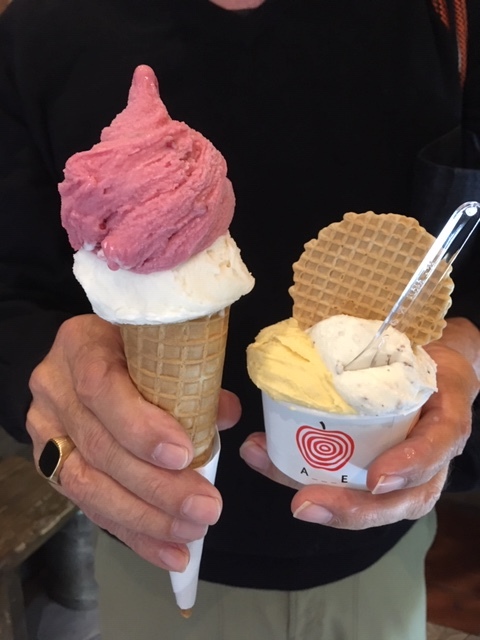 We will miss this gelateria – their gelato and flavors have never disappointed! 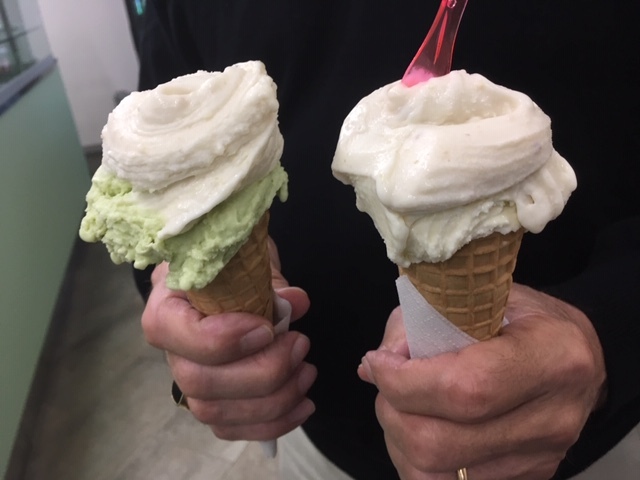 Day #1: We tried Cantina di Gelato, recommended by the ticket seller at the Palazzo Pitti, and it had some interesting and unusual flavors. I had (roasted) pumpkin and turmeric with fig; Brett chose rum with chocolate chips and hazelnut. The flavor cards were written in Italian, English and Russian (and the gelato was delicious)! We have learned a lot these past few weeks about gelato. 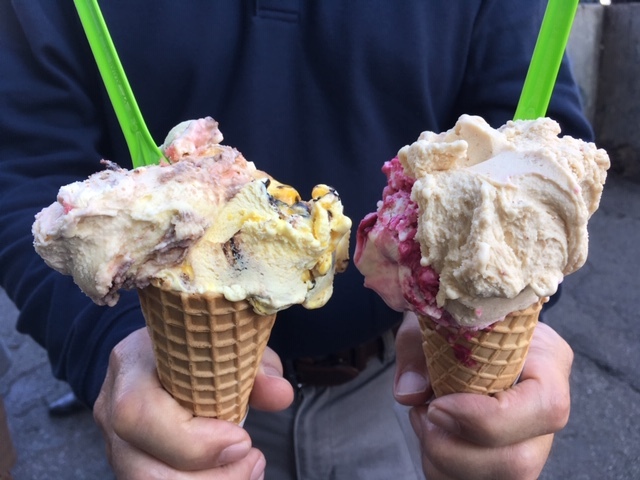 For example, this past week we found out that gelato was most likely invented in Florence – who knew? 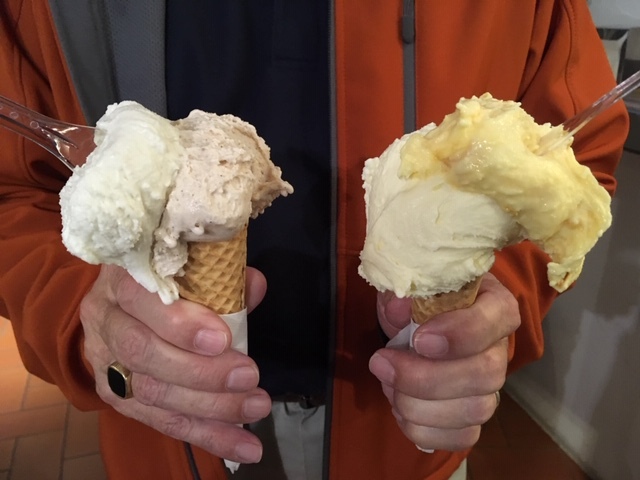 We’ve also learned several tips on how to choose true artisanal gelato. We’ve been on a hunt ever since to eat the best and avoid the worst . . . and mostly succeeded, I think. 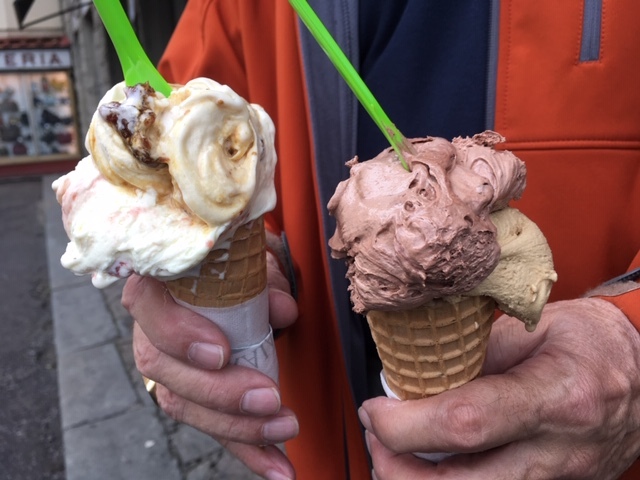 Day #2: Vivoli, near Santa Croce, has been making gelato for 80 years! They only serve their product in cups. My flavors were rum with candied nuts and orange cream, and Brett had blueberry and Japanese persimmon. Day #3: On our way to visit L’Accademia and after my fall, we stopped in at My Sugar. I chose rose (so good!) and matcha latte flavors while Brett had black sesame and hazelnut. 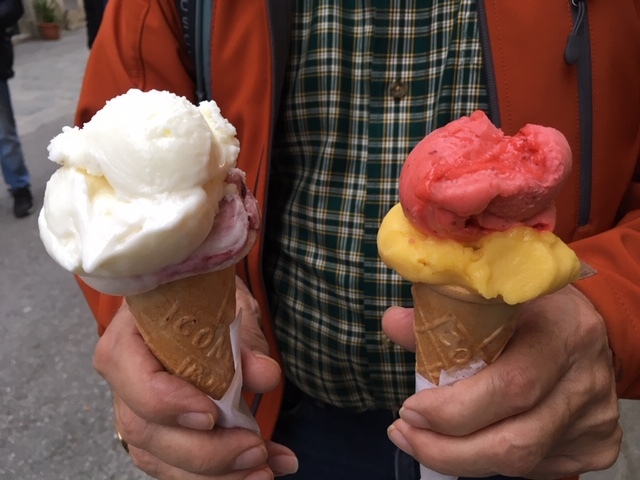 The ticket seller at the Pitti Palace that we chatted with last week, a local, told us that one way to find quality gelato is to look for small, covered containers. 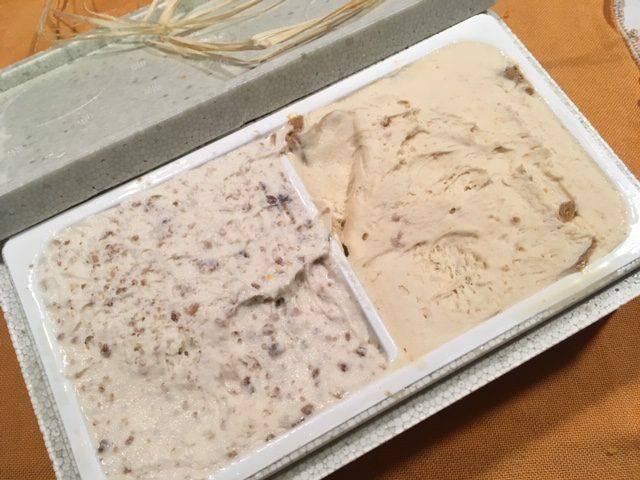 Or, look for small rectangular containers where the gelato inside does not come up to the rim (small batch). Also, make sure the flavor is written first in Italian. Finally, look for muted colors that are found in nature, and not bright “Pokémon colors.” He said if we see gelato in mounds we should run away as quickly as possible, same if we see the flavor cards written primarily in English as it means the gelato is industrially produced and pumped full of fat and made for tourists. 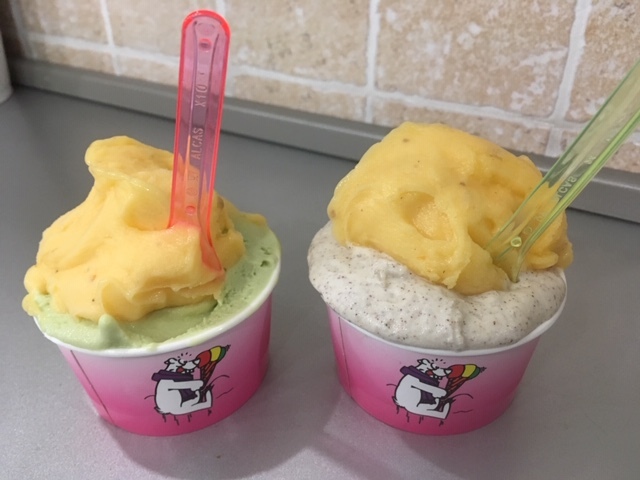 We also found a list of recommended gelateria written by a food writer and sommelier in Florence who leads culinary tours in the city – her site provided us with several new places to try. 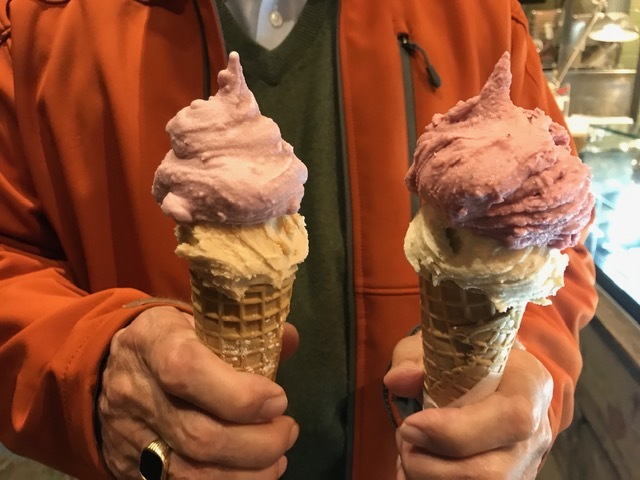 We were pleased to find our neighborhood gelateria, Sbino Gelatificio Contadino, made her list as we stop by frequently. Day #4: We stopped at small gelateria in Vernazza. Their selection wasn’t great and definitely non-artisanal. I opted for sorbetto instead of gelato for a change, choosing passionfruit and strawberry flavors. Brett decided on cherry cream and fiori di latte. 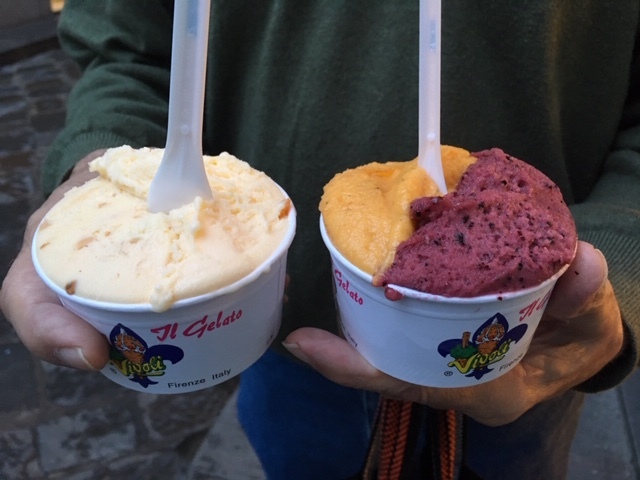 There were a few gelateria open in the Cinque Terre, but we ordered ours in Vernazza, where flavors were limited. Just to show how seriously gelato can be taken though, apparently a gelato war is going on between two shops in the village of Corniglia, with each claiming to be the best. Apparently the whole village has taken sides in the dispute. Day #5: Back in Florence we were tired so walked down to Gelateficio Contradina and they did not disappoint: We both chose the egg cream with sweet marsala flavor, but I chose orange and ginger (very yummy!) for my second flavor, and Brett had coffee. Sunday in Florence was cold and drizzly, but Brett took one for the team and went out in the late afternoon for takeout from our neighborhood shop. 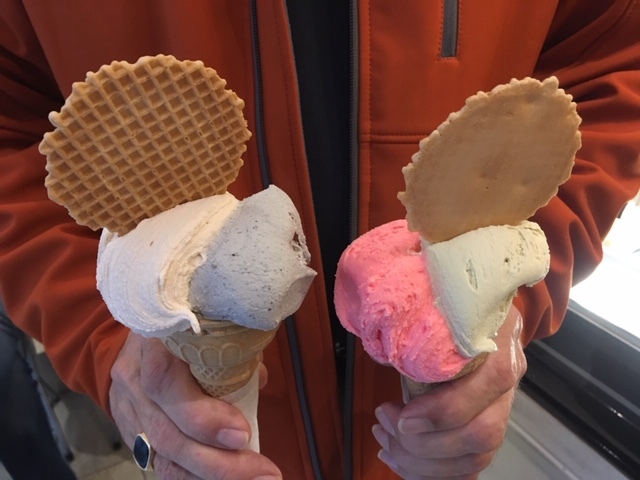 They didn’t have much left to choose from, but he put together chestnut and Speculoos cookie flavors – delicious! Brett’s hand work continues to get better every week. I don’t even have to ask any more – we buy gelato and he’s ready to pose! He’s glad though that we have just one more week to go (maybe two if we continue our quest in Rome). We finished the week back where we started, at Cantina di Gelato because it was one of the few gelateria open on Monday. I got rum with chocolate chips and hazelnut with Nutella swirl and chopped hazelnuts; Brett got passionfruit and ricotta and fig. Day #1: We stopped at what turned out to be an expensive gelateria near the train station to get out of the pouring rain that day. We both ordered malaga (rum raisin) but I added fondonte, a dark, rich chocolate, and Brett chose peanut butter with chocolate. A friend remarked on Facebook the other day that she loved how we had a “sweet tooth in spades” these days. I wrote back that one thing we have enjoyed so much since we started our adventure is how much less sweet bakery items and gelato have been since we left the U.S. Everything from cookies to pastries to pies to gelato seems to have a lot less sugar and fat, and I’m convinced that the reasons Europeans don’t suffer from being overweight like Americans is that a) everyone walks a whole lot more over here; and b) people here eat a whole lot less sugar than we Americans do. Day #3: We had gelato with limoncello at home for Day #2, but on Halloween we headed to our neighborhood gelateria, Gelatificio Contadino, for some of their special flavors. I ordered egg cream with orange and pumpkin pie for my flavors, and Brett had a “beige” cone: cinnamon cookie crunch and ameretto. Gelato looks to be very high calorie but actually has less sugar, fat and calories than ice cream. That’s because it’s made with milk versus cream and usually does not contain eggs or other fats, and does not have as much added sugar. Gelato does not have air whipped into it like ice cream does so it stays creamy. Day #4: We stopped again at La Carraia, rated one of the best gelateria in the city. They have loads of flavors to choose from, and there’s always a crowd there. Brett got chocolate mousse (amazing!) and coffee flavors; I chose walnut & fig and strawberry cheesecake. Day #5: Since we were near the Ponte Vecchio this day we decided to have gelato again at Da Angelo, another highly-rated gelateria. We both got their yummy chestnut flavor, and then Brett added green tea and I had ginger (which had a lovely kick to it). 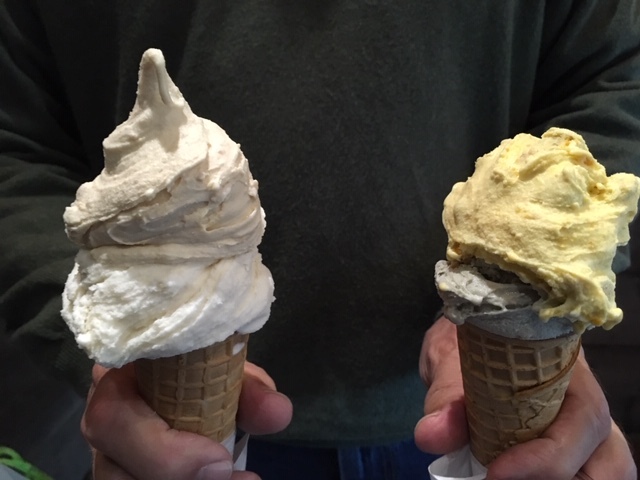 This week we visited our neighborhood gelateria twice because for us they have the most inventive small batch flavors. 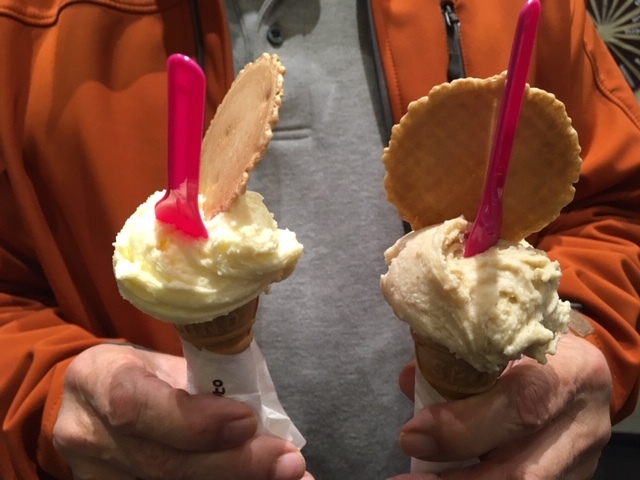 We also stopping in at Da Angelo again (over by the Ponte Vecchio) and at La Carraia to try some more of their delicious flavors, and checked out another new stop when we were out. One rainy day we stayed home and didn’t go out at all, but had vanilla gelato in the freezer and topped some of that with creme of limoncello – heavenly! Day #6: We were back to our neighborhood shop on Sunday. I decided on apple (so, so good!) and pumpkin flower; Brett ordered persimmon cinnamon and Vinsanto cream. Day #7: Brett is on a quest to stop at all of the Top Ten gelateria in Florence, so today we tried Porche no? (Why not?) 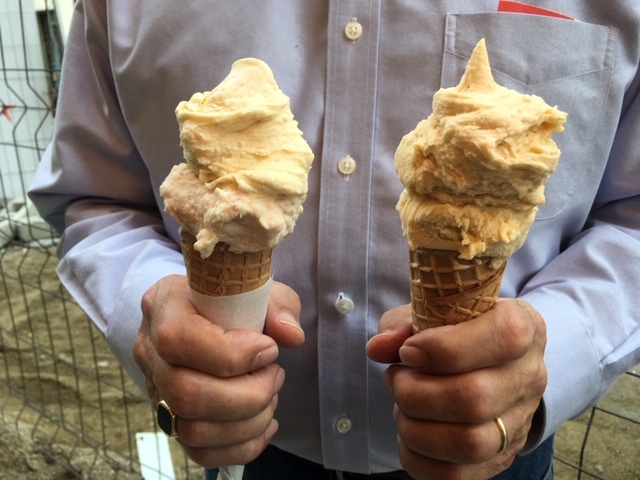 which has been making gelato in Florence since 1939. Their selection and product did not disappoint: chocolate with peanuts & milk cherry for Brett, eggnog & strawberry mousse for me. As we did last week, we try to look for new and unusual flavors, but it was a bit more difficult this past week. Brett again did superb work as the hand model. Day 1: I chose banana and tiramisu flavors (they paired well); Brett had mint chocolate and cookies & cream with chocolate. We’ve been in Florence now for just over a week. One of our many goals while here was to try to have gelato every day, and we’ve been doing a pretty good job of it so far. We missed going out the day before yesterday because of the weather, but otherwise have made a point of indulging ourselves every day. Day 2: Zuppa Inglese and a scoop of panna with chocolate & orange for me; cherries and cream and peanut butter for Brett. The persimmon flavor was so amazing we both had to get some. I added green tea, and Brett had honey vanilla with his. 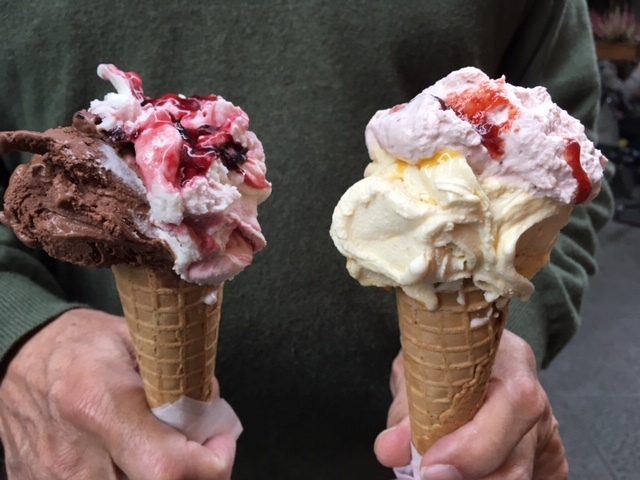 One other great thing we’ve discovered is that you can have two flavors for the same price as one – gelato is sold by the size of the cone or cup, not how many scoops you get. What a concept! 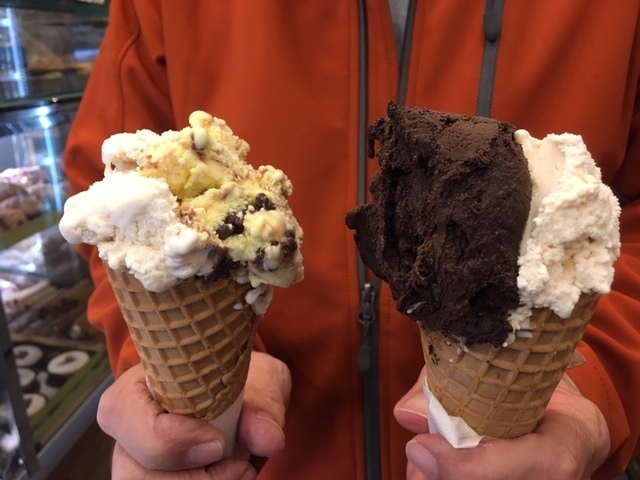 We usually opt to have our gelato in a cone, but tried cups the other day. I didn’t think it tasted as good from a cup or was as fun so it will be all cones, all the time for me now. Brett is fine with having his gelato in a cup now and again. Day 4: I chose ricotta with figs and black sesame. Eating gray gelato was a bit strange but the flavor was fantastic! Brett had mandarin orange and crema, which combined in sort of Dreamsicle. As you can see, the gelato was melting fast that day – it got kind of messy for a while there. One week down, three more to go! Stay tuned for updates. Also, Brett’s job as a hand model is secure. We tried out the little gelato shop just down the street yesterday, before the thunderstorms returned. After sampling almost all their interesting flavors I chose pomegranate and bergamot; Brett had stratiacella (crema with chocolate chips) and zabajone al marsala (egg creme with sweet marsala). Man-oh-man was the gelato at this place good – we’ll definitely be going back! We Had To Come to France . . .
. . . to finally shop at an Aldi market. 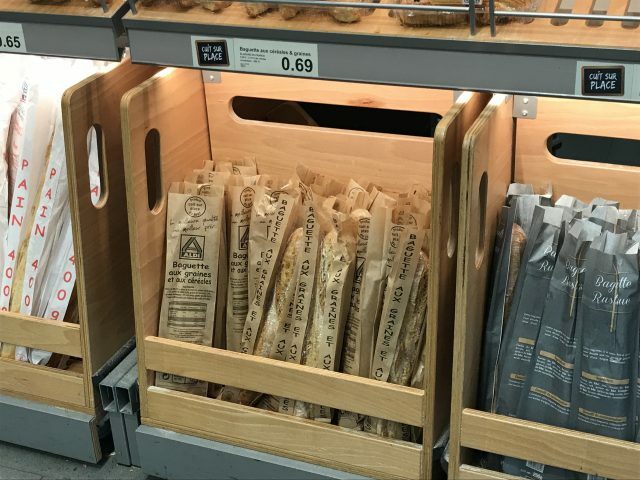 For readers living in the eastern or midwestern United States, or in Europe, Aldi stores are nothing out of the ordinary. But for those of us who live or have lived on the west coast, or in Hawai’i, Aldi products and prices are unknowns, and have taken on almost mythical properties. A few of our Aldi finds. I’ve been reading about other bloggers’ Aldi shopping for several years (enviously at times), so while we are here in Europe, Brett and I were determined to check one out and see what all the fuss was about. We found the nearest Aldi to us was just a 20-minute tram ride away, at the outer western rim of Strasbourg. The ride was pleasant, and we noticed that the closer we got to our destination the more modern the buildings became, along with a definite feeling of being out in the suburbs. We also passed the city’s largest hospital on the way, bigger than any hospital I’ve ever seen anywhere. The mix of passengers on the tram changed as well – the further out the more young families boarded the tram. The aisles were at least twice as long as a usual supermarket aisle. Aldi was right across the street from the tram stop. We had no idea what to expect when we walked in, but the store was absolutely massive, at least in comparison to stores we’ve been in recently and even back on Kaua’i. We grabbed a shopping basket and set out to see what was in stock and what things cost, and possibly pick up a bargain or two. I was expecting pallets, or a more warehouse feel to the store, but was pleasantly surprised by the organized shelves with everything in boxes. Trader Joe’s products could be found throughout the store. They are obviously packaged for the French market even though there are no Trader Joe’s in Europe. I was also surprised by the number of name-brand products that I saw. I’m guessing most of the products were Aldi brands, but it was hard to sort out which were which. We bought some Ritter-Sport mini chocolate bars (perfect for when we’re on the road) but also saw brands like Nutella and several Trader Joe’s products around the store. The cheese section was positively magnificent, and the varieties available were also individually branded. Some were the same brands we’ve seen in standard markets (but were lower priced at Aldi). Our four packages of cheese cost just 7.82€ ($9.09). Incroyable! Actually, the selection available throughout the store was quite impressive. The produce section was pretty nice as well, although I have to say the pineapples were pathetic. I didn’t notice anything organic, but that doesn’t mean it wasn’t there. Of all the things we saw we could only come up with two things we would not buy there: wine and bread. Their low prices didn’t wow us after what we’ve been able to find at local boulangeries or supermarkets. The baguettes were very inexpensive, but we had no idea how old they might be. Besides the Ritter-Sport bars we also bought four different cheeses, some chocolate mousse (delicious! ), a small bag of pasta, a bottle of shampoo, and a package of bacon, potato and cheese crepes to have for breakfast one morning. The total cost for everything? Just 16.03€ ($18.61). We’re definitely going back before we leave Strasbourg. For those of you who regularly shop at Aldi, how does this compare with your experience? Are the prices similar? Does the store layout look similar? 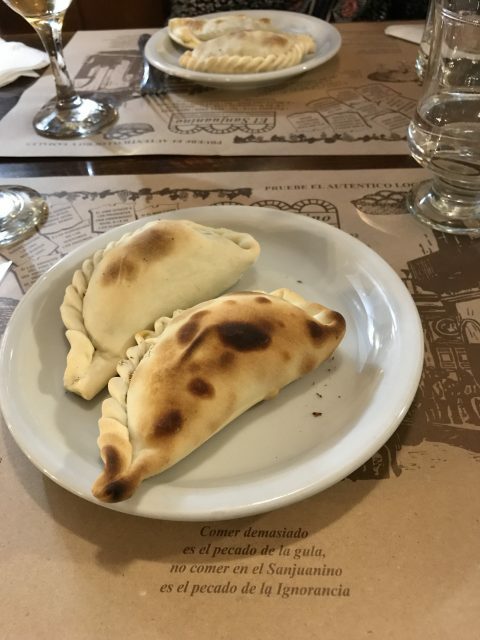 A favorite meal in Buenos Aires was empanadas at El Sanjuanino, located just a couple of blocks away from our apartment. We each had two empanadas, a glass of wine filled to the rim, and shared a flan with dulce de leche for dessert, all for just $16US. Buenos Aires has been a very affordable city, especially when it comes to food costs, and even more especially when it comes to dining out. Our host told us not long after we arrived that it was practically cheaper to go out to a restaurant here than it was to buy food at the market and prepare it ourselves! The low cost of food here combined with recent devaluation of the Argentine peso has meant we’ve had a fairly easy time of sticking to the budget we worked out before we left Kaua’i. Brett has faithfully been maintaining a spreadsheet of our daily spending. He asks for a receipt from any place where we spend, and tracks our daily average to make sure things are not spinning out of control. So far we’ve been able to stay slightly under our daily budget of $40US that we alloted for our time in Argentina and Uruguay. Beyond food/dining costs our daily expenses have included items like tours, taxis, subway fares, tips, etc. for the time we’ve been here. Because of the lower price of food we’ve had some leeway that we’re probably not going to have when we arrive in Europe – we’re going to have to be far more careful there. I’m positive we’ll be having far fewer meals and such out in town than we’ve been able to enjoy here. We’ve eaten breakfast at our apartment every morning. As food is typically our biggest daily expense, our very first outing in Buenos Aires was to a nearby supermarket, and we have prepared most of our meals here in our apartment. 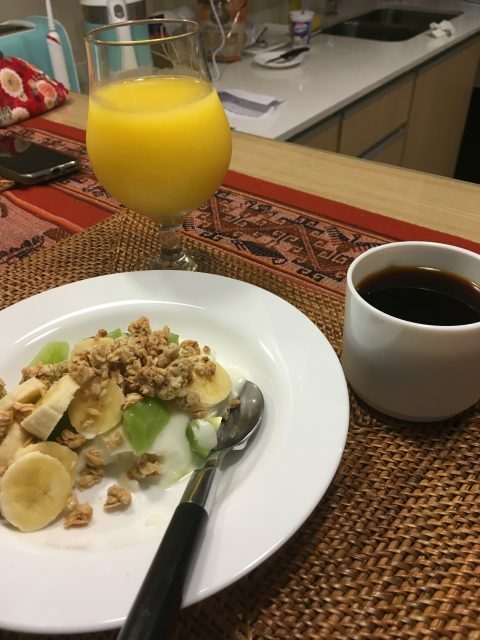 We’ve had breakfast “at home” every morning, usually yogurt topped with fruit and granola that we brought along with us, along with orange juice and coffee. A few times we’ve eaten “Argentinian style,” enjoying coffee, juice and a couple of mezzaluna (croissant). The mezzaluna here are a bit smaller than the croissant we get back in the U.S. and are not as flaky; they are also brushed with egg whites and topped with a sprinkle of sugar . . . and completely delicious and satisfying! Bakeries in Buenos Aires have provided affordable treats. 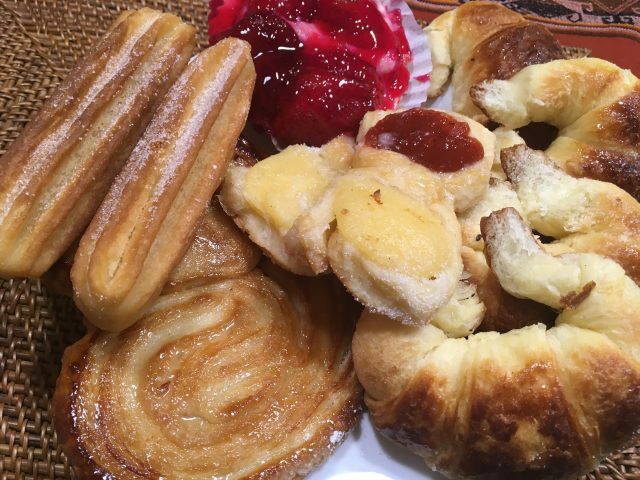 We picked up a strawberry tart, a huge palmier, two churros, two fruit danish, and four mezzaluna the other day just $5US. We’ve skipped lunch most days and instead stopped at a coffee shop in the mid-afternoon for a beverage and a shared pastry. I discovered that fresh fruit juices are often on the menu here, and have sometimes enjoyed having a glass of juice instead of coffee in the afternoon. My favorite so far was a combination of strawberry, mango and orange – very refreshing! Beef is what you eat in Argentina, so we went out for dinner one evening at Fervor, another nearby restaurant. Brett had a perfectly cooked 12 oz. 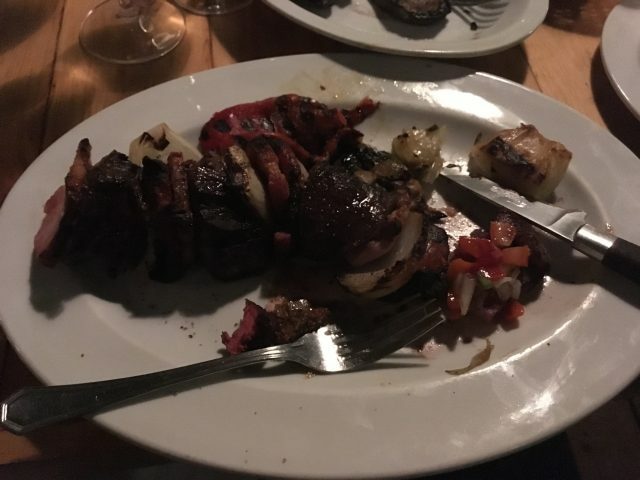 beef tenderloin brochette, I had longostino and we shared a plate of grilled vegetables. Each of us had a BIG glass of wine, and we shared a dessert. Total cost for everything, including a tip, was half of what we would have paid in the U.S. for the same meal (apologies for the pictures’ dim lighting – I blame the beautiful restaurant ambiance). In the early evening, we’ve usually relaxed in our apartment with a glass of wine along with some local cheese and crackers. Good wine is ridiculously cheap here: a bottle of decent chardonnay can be had for as little as $2.50, and a big glass (like filled up to the rim) of quality wine at a restaurant goes for around $3.65. We’ve gone out for dinner just twice; all other evenings we’ve eaten dinner in the apartment. Dinners out were for empanadas one time and for a fabulous meal of Argentinian beef and seafood. In all cases, whether we’ve cooked our own meals or picked up something from a bakery or eaten at a restaurant, the cost has usually been half or less than half of what we would have paid in the U.S. for a comparable meal. 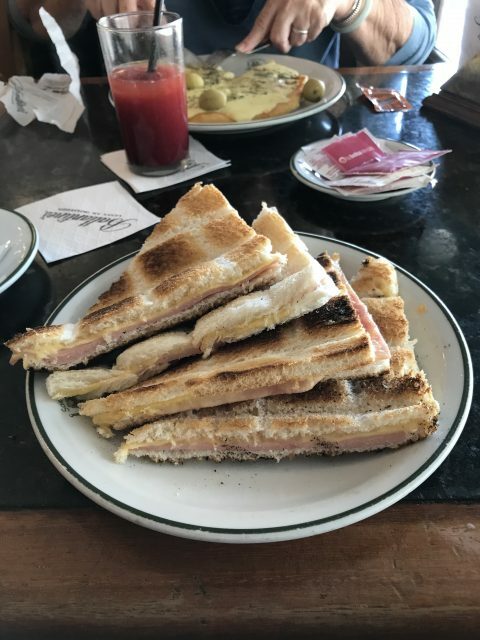 Brett had a classic Argentinian grilled ham and cheese sandwich for lunch one day at La Biela while I had a simple cheese pizza and fresh strawberry juice. La Biela is an old, famous restaurant in our neighborhood, and going for lunch versus dinner kept it affordable. One big thing we’ve noticed here is that other than buying food, neither of us has been tempted in the least to purchase anything else, quite a difference from how we travelled in the past. The old version of Brett and Laura would have been drawn into countless shops and rationalized buying something no matter how much further traveling we were going to be doing or how the budget was holding up. These days we stand and look in windows and admire, and then remind ourselves there’s no room in the suitcases or the budget and go on our way! 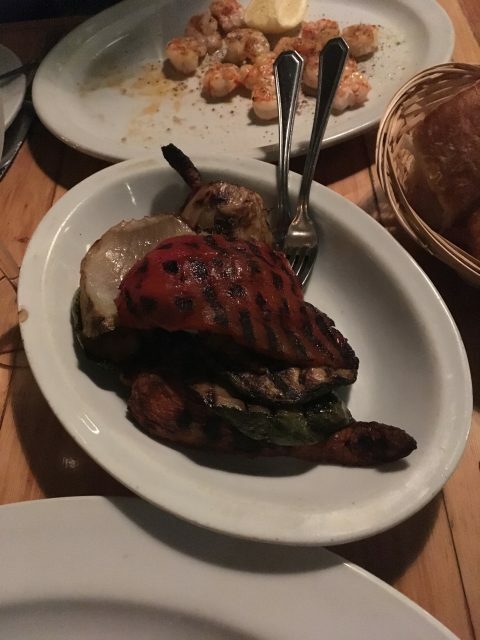 Buenos Aires has been a great place to test our ability to stay within our daily limits, but with food costs so low we’re not sure how our experience here will extrapolate to future destinations. We’re on our way to Uruguay tomorrow, where the peso has a stronger exchange rate with the dollar. We have also set a higher daily budget for our time in Europe, but whether it will be enough remains to be seen. 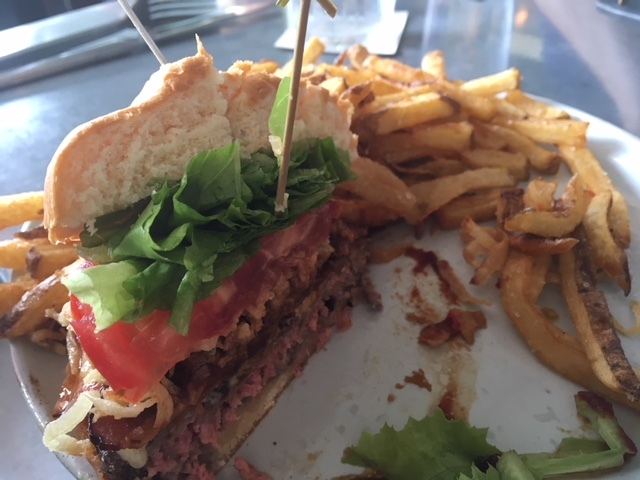 Duane’s Ono Char-Burger: Located in Anahola, the Ono Char-Burger was the first place we ate at on our first visit to Kaua’i back in 2012, and their burgers are still our favorite. YaYu isn’t eating beef these days but plans to order their fish and chips which are also very tasty. I’m going to have one last Local Boy burger (my favorite), and Brett will probably have his favorite, an Old Fashioned burger. 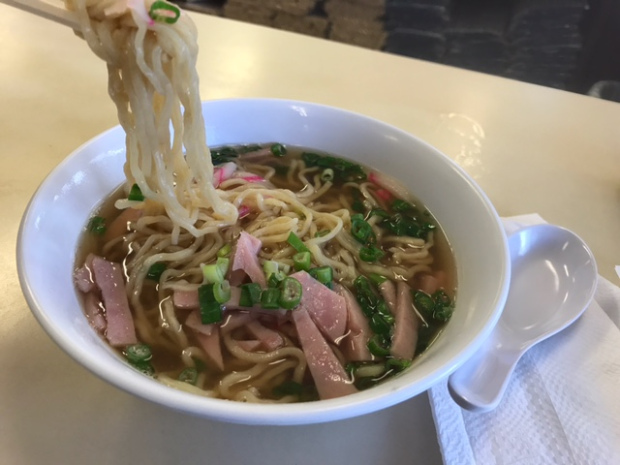 Hamura’s: There’s no way we can leave Kaua’i without having one last bowl of Hamura’s famous saimin and one last piece of their lilikoi chiffon pie. 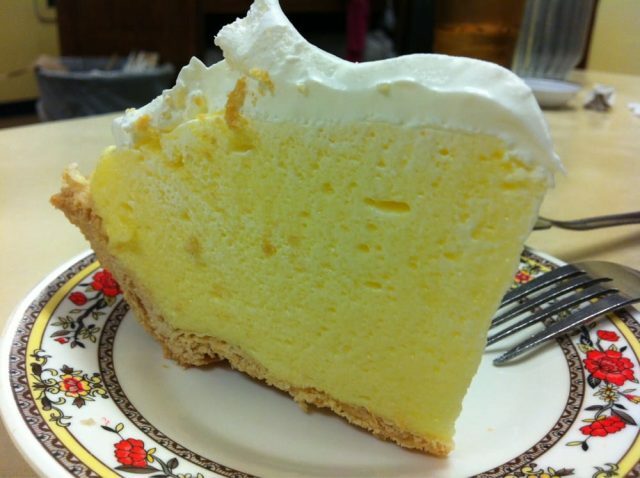 TipTop Cafe: We’re planning to go out for breakfast at the TipTop the morning before we leave. 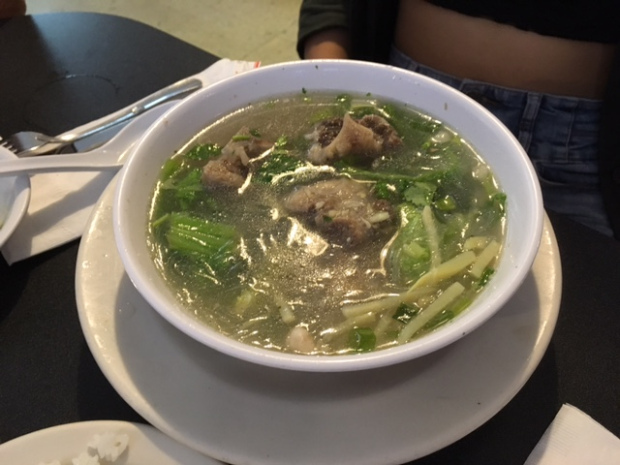 YaYu says she has to have one more big bowl of their ox-tail soup, and Brett and I want one more of their big, fluffy macadamia and banana pancakes and a couple of big cups of their delicious coffee. 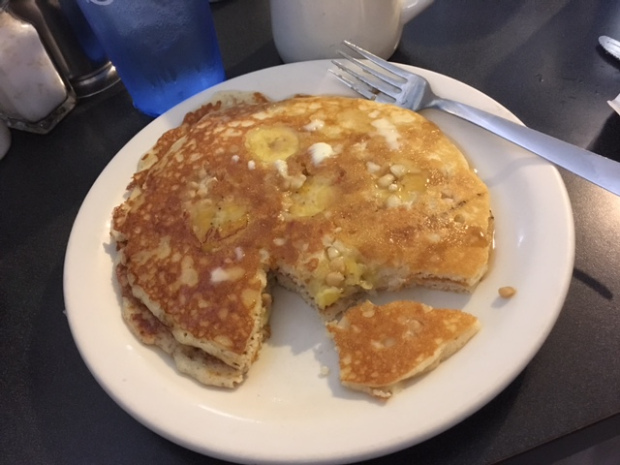 Plate-size banana-macadamia pancakes at the Tip Top. I also want to enjoy one more TegeTege green tea shave ice, and we’re planning on going out for a special dinner down in Poipu, at Roy Yamaguchi’s Eating House 1849, on our last weekend, but otherwise we’ll be finishing up as much as we can of we’ve got here in the condo before we hit the road. 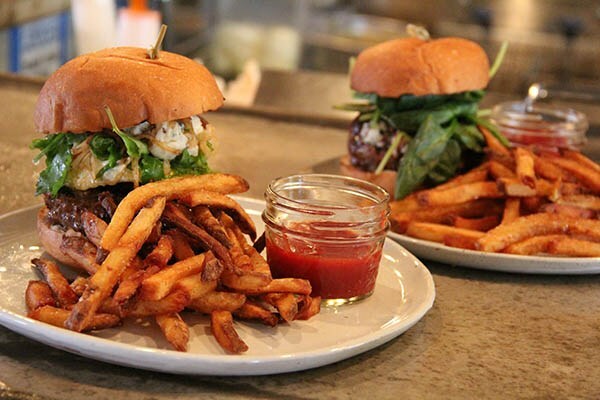 The Napa Burger: Point Reyes blue cheese, cabernet onions, port reduction and spinach, served on a freshly baked roll along with hand-cut sea salt fries and homemade ketchup. Street Burger however, located in Wailua on the east side of Kaua’i, takes the humble hamburger to a level that is definitely gourmet. The restaurant has become one of our favorite places to eat on the island, and our go-to restaurant when we want to enjoy a meal with friends. Brett’s half of the bacon-barbecue burger we shared (plus all the fries). The burgers at Street Burger are HUGE. Half of one is plenty for me these days, and Brett and I usually share (although he gets all the fries). Each burger is a virtual tower of hamburger goodness. There are 17 different burger versions to choose from, from a classic hamburger, cheeseburger or bacon-barbecue burger (my favorite!) to a Greek burger with olive tapenade, feta cheese, tzatziki, cucumber and spinach. Other creative burger examples include the Wailua, (crispy spam, jalapeño-pineapple marmelade, kabayaki glaze and spinach) or the Southern burger (fried green tomato, pimento cheese, greens and buttermilk-chive dressing) or the Italian (prosciutto, bufala mozzarella, arugula pesto, marinara and spinach). A vegan burger is available for those who don’t eat meat, and is just as glorious as their other offerings. Each burger is cooked to order on a big wood-fired grill, served with hand-cut sea salt fries and house-made ketchup, and is a masterpiece from start to finish. Street Burger also offers exciting and interesting salads and sides, including to-die-for onion rings, or one of Brett’s favorites, Texas Poutine: Texas-style chili over fries, with sharp cheddar cheese, a fried egg and fizzled onions. Beginning with the burger, everything is as local as can be achieved here. 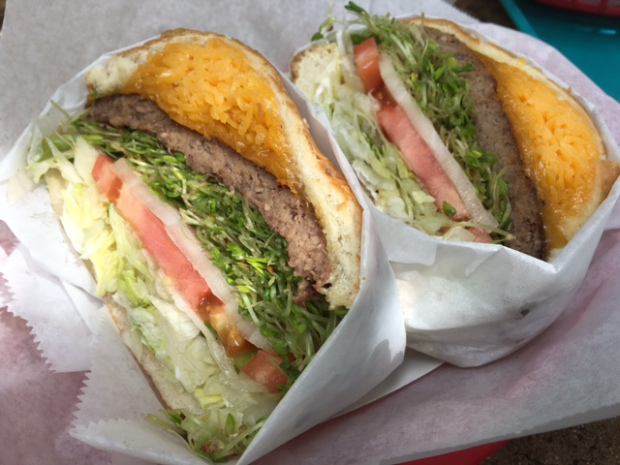 The hamburger patties are made from Kauai-raised grass-fed beef, and the produce comes from local farmers. The rolls are made on site. The ice cream is made on Kaua’i (Lapperts) and the coffee served at the restaurant comes from Java Kai in Kapaa. Even the ketchup is made from scratch. 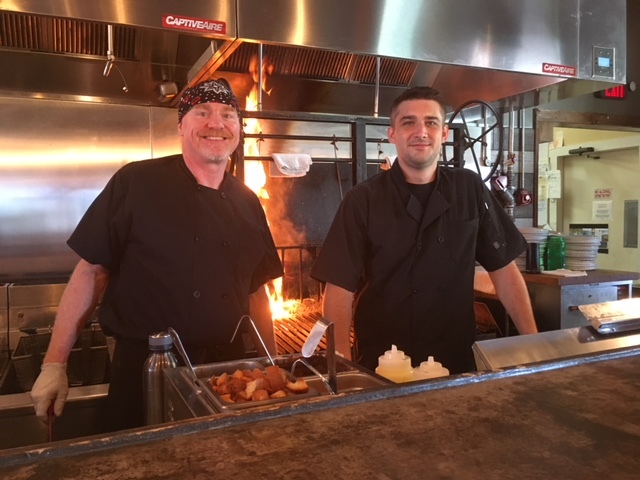 Sitting at the counter and watching these guys work the grill is a great place to enjoy your meal at Street Burger. For all the amazing deliciousness of their creations, Street Burger is an affordable dining choice. The burgers range in price from $10 to $17, and for that you get a LOT of food. Even when Brett and I share an order, there are still usually leftovers to bring home. The restaurant also offers a large selection of craft-brewed beers, and has an interesting wine list. Dining is available inside the restaurant or out on the patio, where guests can enjoy a stunning view of the Sleeping Giant. Another fun seating option is at the counter that surrounds the grill. We did that on one trip and had a fun time throughout our meal watching the burgers being made and chatting with the cooks. 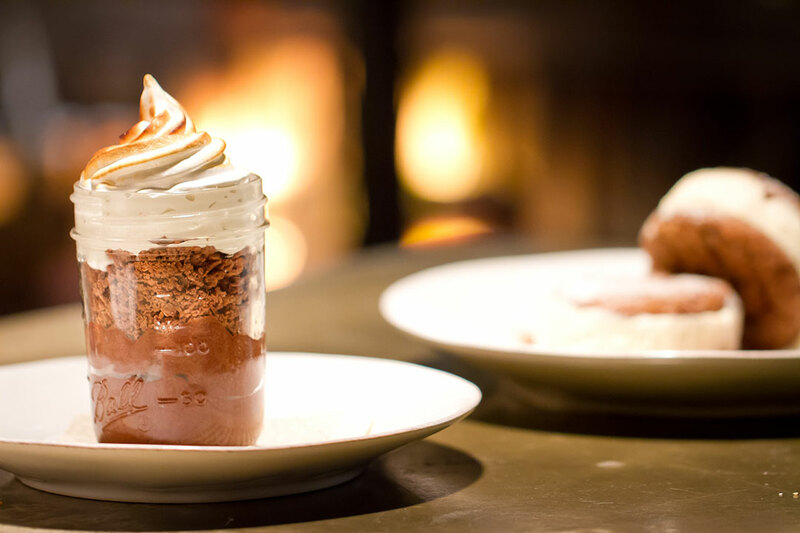 It’s also worth it to save some room (if you can) for one of Street Burger’s desserts. They are divine, and well worth the extra calories! 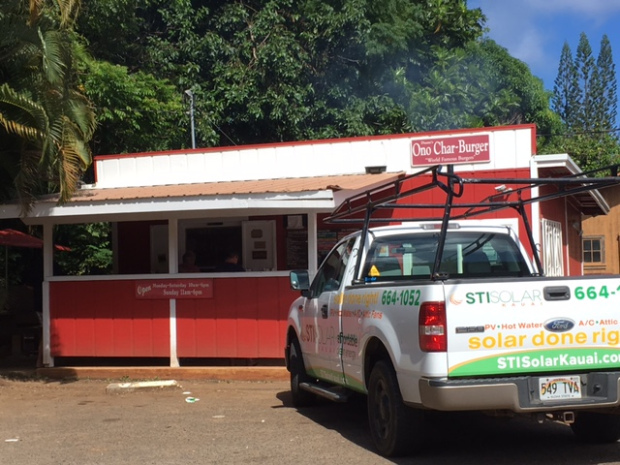 Street Burger is located at 4-369 Kuhio Hwy, in Wailua, just north of the old Coco Palms hotel on the mauka (mountain) side of the highway. They’re open Tuesday through Saturday, 11:00 a.m. to 10:00 p.m. This Week’s Menu: Let the Favorites Begin! 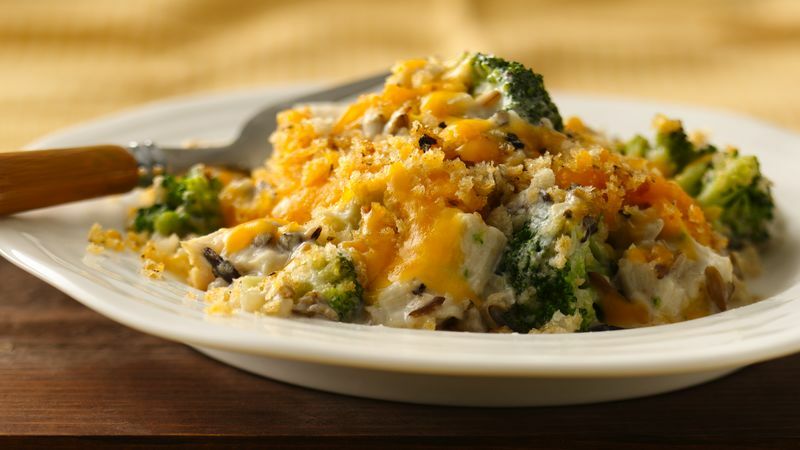 Turkey divan casserole is Meiling’s favorite recipe, or at least in the top three. I add noodles to the casserole when I make it. Beginning this week, and for the next month or so the menu will revolve around the girls’ favorite meals. There will be no new recipes, no experimenting, etc. – just dishes that they enjoy and either can’t make or can’t get wherever they are. Coming up with a menu of favorites though was more difficult than I thought it would be. The biggest problem is that I don’t want to fix certain things upfront for Meiling when WenYu will be arriving home the week after and have to repeat them. It was a bit of a juggling act trying to think of what to make early and what to save for later. We’re picking up a pizza at Costco on Wednesday – that’s the day of the Big Shop and along with the farmers’ market trip I know it’s going to be an exhausting day and I’m not going to feel much like cooking that evening. We’ll let Meiling choose which kind of pizza she wants, and then Brett will fix it out on the grill. Brett is going to make Scotch Eggs on Sunday – Meiling hasn’t had them yet, but we’re pretty sure she’s going to love them. Cucumbers, bok choy and green beans are the only “must buys” at the farmers’ market, and I’ve got my fingers crossed that we’ll be able to find broccoli (if not, we’ll have to make a run to the store). I also want to get a papaya, some limes and we’ll let Meiling pick out some fruit she wants (like starfruit). 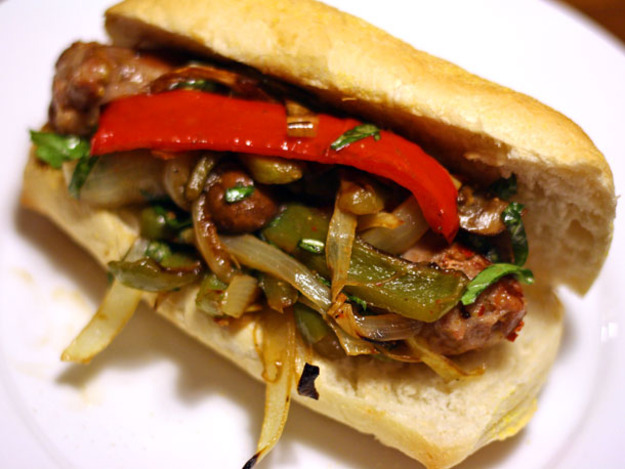 Italian sausage, pepper and onion sandwich – YUM! This is the last week for a while of just Brett, YaYu and me at the dinner table. Meiling arrives home next Monday, and WenYu will be here a week or so after that. Both girls have made lists of the dishes they want me to prepare while they’re home, favorites that they miss while away at school. Both are hearty eaters too, so we are not likely to have many leftovers in the coming days for YaYu’s lunches. And of course, holiday meals will be coming up as well. I will be busy in the kitchen, but on the plus side am likely to get a lot of help from the girls, especially Meiling, who has finally taken up learning to cook. I can’t wait! I am greatly looking forward to having both our college girls back home for a while, and to cook for them again. But in the meantime, I am going to enjoy the calm of this week and cooking for just the three of us. The cilantro and lime chicken things we were going to have last week got bumped to this week – YaYu had an evening event last Friday so Brett and I ate leftovers, and I pushed everything back a day on the menu to cover for that. All we really need this week from the farmers’ market are cucumbers and papayas. If the farmers have broccoli we’ll get some of that too, and maybe some cauliflower.